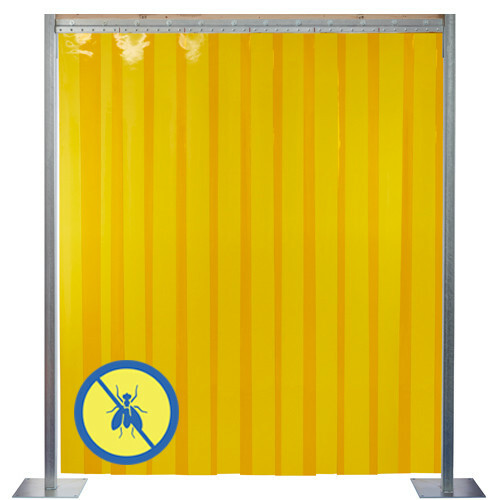 Strip doors made from insect yellow material are often called no-bug or anti-insect strip doors. The yellow color helps to reduce the attraction of insects to the light sources on the other side of the strip door. The most common applications for Insect Control Strip Doors include food processing facilities, printing facilities, supermarket and warehouse applications. This style of strip curtain is extremely popular in the South and other climates where insects are prevalent. PVCStrip.com's Insect Control Strip Doors have several different varieties that help you customize your door, such as style, strip width, door size, and mounting hardware.